The Avett Brothers have been slowly transforming their sound in the six years they’ve been releasing records. They’ve winnowed the best parts of their rag-tag and raucous energy and truly begun to marry it to their growing skills as songwriters. Now, on the verge of recording their first major label album for American Recordings and having Rick Rubin put his stamp on their work, they’ve released a final EP for their long-time indie home, Ramseur Records. Their last LP, Emotionalism, was the most instrumentally complex the band has attempted and it was the most full they have sounded as well. So The Gleam II may come as a bit of a surprise. For one thing, Bob Crawford’s bass is completely missing. 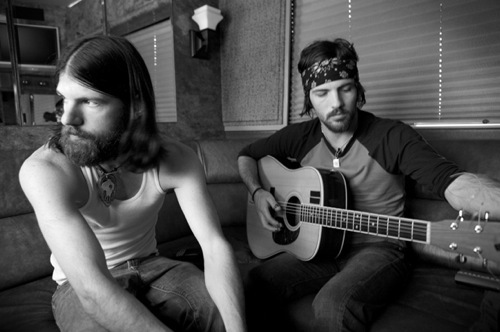 Instead, the six songs focus on Scott and Seth Avett’s melodic, melancholic, songwriting – all singing, all guitars, banjos and little else. If there are songs to look back to for comparison, think Four Thieves Gone‘s “Sixteen in July” or Mignonette‘s “Pretty Girl at the Airport,” but neither of those approach the intimacy of these recordings. The natural reaction might be to look at this as a step back, but the EP goes a long way to silencing some of the band’s critics. A fellow DJ friend of mine is fond of calling them ‘the tone-deaf brothers,’ a criticism that could be leveled at some of the rowdiest and shoutiest moments in their catalogue, but here the brothers take turns laying out gorgeously sung songs that show just how deft at melody they are. The other thing that comes across is, compared to their earlier songs, the ones that closest approximate these in style and instrumentation, the brothers have grown immensely as songwriters. I actually prefer this and the earlier EP to much of their more raucous material. I’m hoping for a third, fourth, etc., sometime down the line. I’m also hoping Rubin doesn’t ruin the band, who sound just about perfect already. Thanks for this excellent post. I’ll have to go out and find both of the Gleam EPs. Another recording that you can compare it to is the promo single that contains only two tracks including “In the Curve”(one of my all time favorites) and “Tale of Coming News”. Both tracks were available on Itunes with the Gleam Ep. I highly suggest seeing them live. They are the beatles of bluegrass they gots the stuff!! !